Our shoulders allow freedom of movement in all directions, but at a cost…our shoulders can be unstable. Our arms are connected through a shallow ball-and-socket contact with our shoulder blade (scapula). Our shoulder blade floats on our back, suspended by a complex set of muscular connections to our spine, ribs and even our skull. Small rotator cuff muscles work together to keep our arm (ball) connected to our shoulder blade (socket). 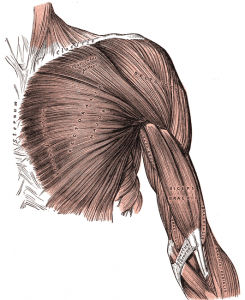 The further we reach, the more strain we place on this strings (muscles) holding our shoulder in place. 2. Keep your shoulders in neutral! 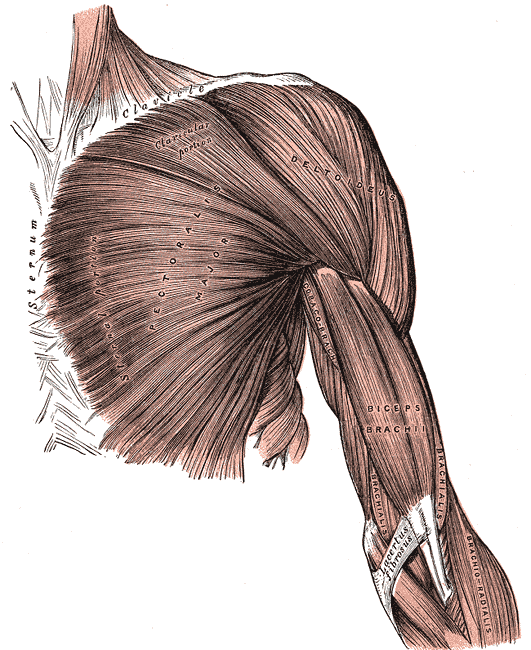 Shoulders can move in all directions because of the ball-and-socket structure (see above) and because the shoulder structure is not rigidly connected to the rest of the body. This allows for impressive mobility but results in reduced stability. Maintaining a strong and injury-free shoulder means keeping it in a strong position whenever possible: elbows close to our sides (within 20 degrees forward, backward or to the side whenever possible). In this neutral shoulder position the back and rotator cuff muscles that support our shoulder are able to do their work best. It’s time to take a look at how you can reposition your work to protect your shoulder! If your work is too high, out of reach, or awkwardly positioned, your shoulder will suffer. Position your work so your elbows are close to the side of your body and you don’t have to reach or twist to access your work. Let your arms hang beside oyur body, and swing your arms 20 degrees forwards and 20 degrees sideways. Keep your work within this range as much as possible. Do not reach across your vertical midline, keep hands on their respective sides, point your elbows to the ground, and as much as possible avoid using overhand grip. Never reach behind your body, turn to face what your work. For example, don’t reach into the backseat of your car! Rotator Cuff muscles are small and not very powerful, but they must put up with a potential 2 foot long lever (your arm) that may extend at any time without notice, while sometimes holding onto something! Holding a 10lb weight at arms length can put up to 10x (100lbs) of force on the shoulder joint! Respecting our limitations can keep our shoulders healthy and productive in years to come! Shoulder injuries can creep up on us over time, this checklist will allow you to be mindful of whether you are experiencing shoulder problems. Is your shoulder comfortable when sitting in your easy chair or when at rest by your side? Does discomfort in your shoulder have an effect on your sleep? Can you painlessly reach the small of your back to tuck in your shirt? Can you painlessly place your hand behind your head with your elbow out to the side? Can you painlessly lift one pound to your shoulder slevel without bending your elbow? If you have any pain, seek professional help.